Here's complete cruising comfort for four, whether it's just for a weekend or all summer long! Full headroom, completely equipped galley, private toilet room and full length berths make the new Model 25-4 Trojan Sea Breeze as comfortable as a cottage. Dependable 100 H.P. or 135 H.P. (with hydraulic reverse) marine engine provides speeds up to 28 mph and Trojan's planked, solid mahogany hull is designed for excellent rough water performance. Spacious four foot galley with Micarta top, stainless steel two-burner stove with remote alcohol tank, stainless steel sink, stainless steel 8 cu. ft. refrigerator, 24 gallon water system. Pull-out dish and tumbler racks enclosed in storage cabinet. -- Private toilet compartment with full headroom; marine type toilet installed and side window ventilation. Laundry Hamper. -- Dinette for four has fold-away dinette table with easy-to-clean Micarta top. Upholstered seats and seat backs become comfortable double berth by night. -- Forward compartment includes two full length berths, two cabin lights and hatch to forward deck. Berths are fitted with 3" foam rubber cushions protected by heavy vinyl plastic zippered covers. -- Lots of storage space including hanging lockers, self-locking drawers and cabinets. Other standard equipment includes: five cabin lights, Class I navigation lights, opening flying bridge and cabin windshields, automatic electric bilge pump, bilge blower and fire extinguisher. Only a Trojan Sea Breeze evidences so much thought and careful planning in its basic construction and equipment to assure your cruising comfort, safety and pleasure . . truly the "essential luxury" for your family. OPTIONAL EQUIPMENT INCLUDES: Convertible canvas top with chrome fittings, side and back curtains to cover entire cockpit, set of five plastic snap-on window screens. Unmatched for their rich, sparkling finishes and trim, graceful lines, Trojan boats catch the eye wherever they go. Trojan design is so truly outstanding that today, virtually every model in the full line of cruisers and runabouts has its imitators. Trojan's superb finishes, rugged durability and fine design add up to more boat for your money. This means more value any time . . . especially when you decide to trade up to a newer or larger Trojan model. 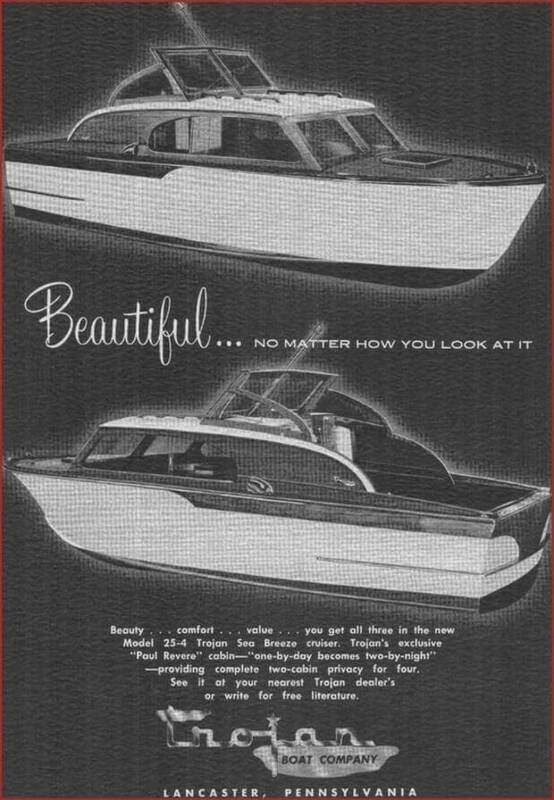 Trojan has pioneered many construction features now adopted by many other boat builders. For example, the self-bailing motor well and solid mahogany planked decks bonded to marine plywood are Trojan "firsts". You can depend on Trojan designers and craftsmen to lead in the development of the safest, most pleasurable boats afloat. Today, as always, Trojan boats are constructed of the finest materials, carefully selected, accurately machined and fastened for salt water use to assure tight hulls for many, many years.